A Democratic lawmaker from California referred to Middle America as "Podunk, USA," during a committee meeting last week, several sources inside the meeting told the Washington Free Beacon. 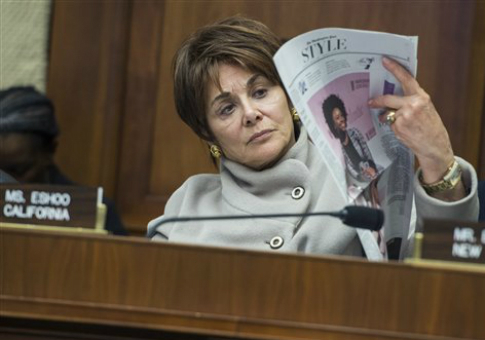 Remarks by Rep. Anna Eshoo (D., Calif.) during a closed-door Energy and Commerce Committee meeting with Federal Communications Commission Chairman Ajit Pai raised eyebrows from those present. The moment occurred when Eshoo pushed back against Pai when he was discussing expanding broadband access to rural areas. Pai said that eliminating Title II net neutrality rules would benefit places he has traveled to, such as Parsons, Kan., Elverson, Pa., and Cadillac, Mich.
Sources inside the meeting told the Free Beacon that Eshoo was frustrated with Pai's comments. She wished out loud that Pai would stop talking about "Podunk, USA" and instead be more concerned about the venture capitalists on Sand Hill Road in her district near Palo Alto, according to the sources. Many in the room reacted negatively to Eshoo's remarks, sources said. A member who represents a flyover state did not appreciate the term "Podunk," which means a small, unimportant town, and said districts in Middle America are just as important as those in Silicon Valley. Eshoo's office declined to comment. Democrats have been criticized for being out of touch and representing only the interests of coastal elites since suffering significant losses in the 2016 elections. House Democrats opted to reelect Nancy Pelosi of San Francisco as their leader rather than Tim Ryan, who represents Youngstown, Ohio. The FCC's plan to reverse Title II net neutrality rules, which would end the Obama administration policy of treating Internet service providers as utilities, has become a hotly contested issue, with Chairman Pai receiving death threats. Pai believes net neutrality subjected Internet providers to unnecessary regulatory burdens. He has made expanding broadband access to rural areas a top priority of his chairmanship.